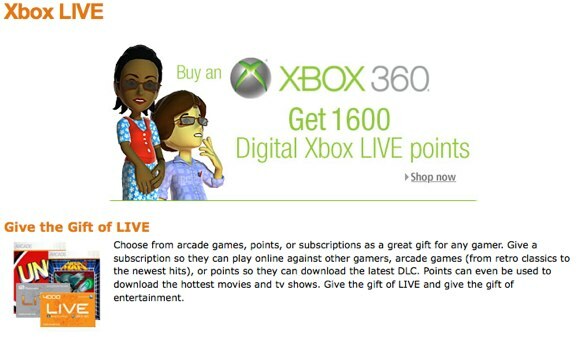 Amazon.com launched its "Amazon Xbox Live Store" today, where the online retailer offers Microsoft Points cards, Live subscriptions and -- here's the interesting part -- Xbox Live Arcade game codes. Previously, XBLA titles were only available through the console (and on limited compilation discs), making Amazon the first retailer to sell codes for downloading these games. At this time, there doesn't appear to be any obvious financial advantage to purchasing arcade titles through Amazon (unless you have a gift certificate to redeem there and if taxes aren't applied to your purchases). Christina DeRosa, general manager of Microsoft's Xbox Live Business, claims this partnership is good because it extends the Xbox storefront to Amazon, a company which "is helping make digital distribution more mainstream." And that seems to be the core idea in this curious move: Amazon is a trusted mainstream brand. While Mom and Dad may not trust little Timmy and Suzie using the credit card to purchase points on the console, they'll have little reservation about purchasing the product codes through Amazon. Sure, to us it's an extra step in getting our games, but we're obviously "special." Right, Mom? Update: Commenter Butaneko brings up a good point: If you rock an Amazon Visa card, the company sends a $25 gift certificate for every 2500 points earned (calculations on how that happens vary depending on how you use the card). The certificates could always be used on games and MS Points cards, but now it's possible to buy XBLA games direct for "free." Amazon selling Xbox Live Arcade game codes originally appeared on Joystiq on Wed, 08 Apr 2009 11:24:00 EST. Please see our terms for use of feeds.